For the owners of the home on Woodhams Road and Mauricia Avenue in Santa Clara, their plan is reasonable. Add a story to their home, preserve its modern style – which they love – and by going up, preserve open space and trees. But some neighbors and modernist fans see it differently – as a major hit against an up-and-coming, soon-to-be rediscovered mid-century modern neighborhood designed by Eichler’s architects Anshen & Allen. The city’s Architectural Review Commission has given the go-ahead to the proposed remodel, and the approval is likely to stick. 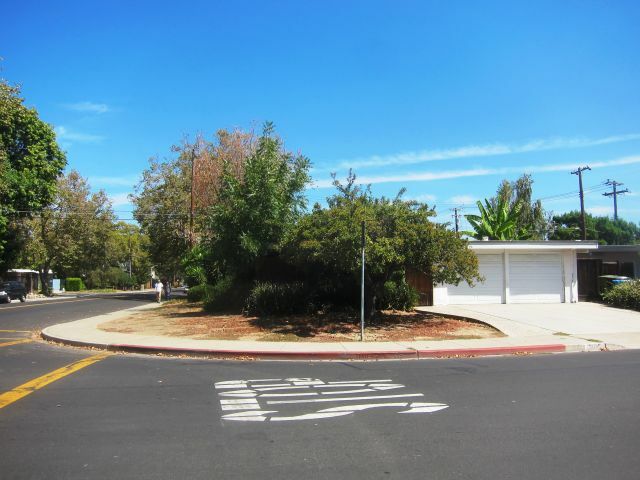 The vote was unanimous and, surprisingly to people who believe the Maywood Estates enclave of John Mackay homes in a mid-century modern treasure, a majority of neighbors who spoke at the meeting, both from the tract itself and nearby streets, supported the remodel. A few blocks away, in a neighboring tract by Mackay, also designed by Anshen & Allen, a similar corner retains its original home. Approval came after the applicant agreed to lower the height of the remodel by about a foot, adjust window placement, and drop proposed balconies. That’s good for the Parikh family; the previous plan would have destroyed their privacy, Parikh says. The plan could be appealed to the Planning Commission or City Council but, project opponent Stephen Estes says, “given the support of the neighbors, marching into the Planning Commission would take a lot of work and would probably not accomplish much." Earlier, the proposal had been unanimously rejected by the city’s Historical Landmarks Commission, which sees the neighborhood as potentially a historic district even though, at this point, it has no such designation. 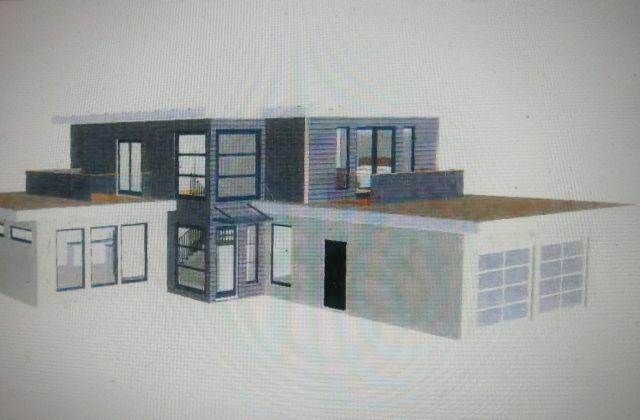 The two-story home, opponents claimed, would be out of scale and character with its one-story neighbors, and the new home would destroy their privacy. Estes, who lives in the neighborhood, built by developer John Mackay in the mid-1950s, says the size of the house and its prominent location will affect the general look of the neighborhood. Not much can be seen from the street of the current house at 3045 Mauricia. 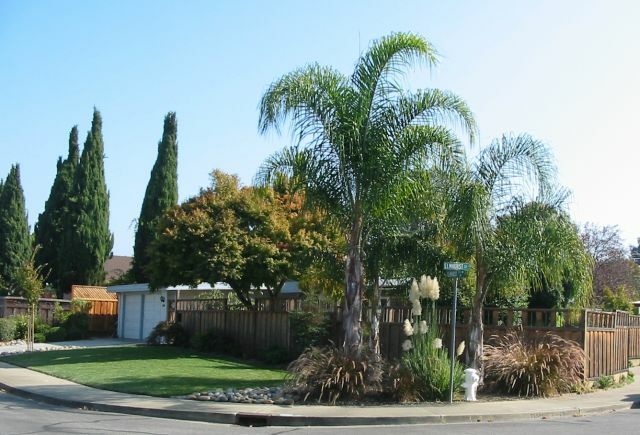 Estes, who is also a member of the city’s Historic Landmarks Commission, has been trying for years – in his role as a private citizen – to bring more attention to the three Mackay tracts of homes, all designed by Anshen & Allen, in Santa Clara, and thus ensure their preservation. 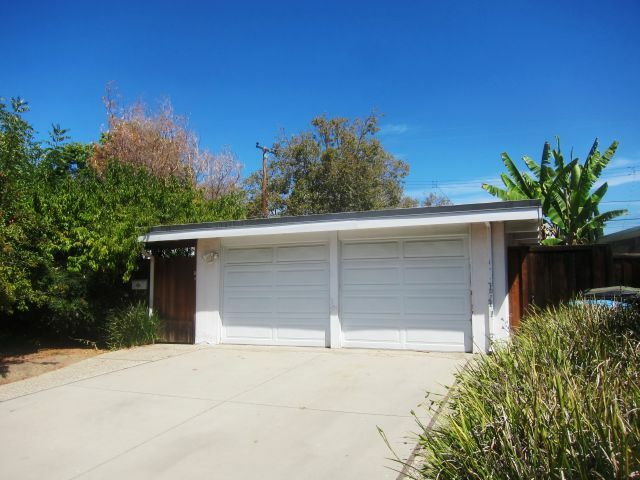 Anshen & Allen were also the original designers of Eichler homes. Estes voted along with his colleagues to oppose the proposed remodel, and says that seven members of the public spoke against the proposal and that none spoke in favor at the historic landmarks meeting. The Mackays, known also as “patio homes” for front patios that were originally provided privacy by fencing, are not nearly as well known among modernist fans as the Eichler homes that were designed at the same time by the same architects. In trying to preserve the homes, Estes is up against many forces including, he says, the high tech boom. “The neighborhood is a mile and a half from the Apple campus, so the pressure on the neighborhood is only going to increase,” he says. Plus, many people today simply prefer more living space than these small homes provide. The owners of the home to be remodeled spoke to their neighbors to win support. They are longtime residents of the neighborhood, and say they are fans of modern design and have tried to have their remodel blend into the neighborhood. 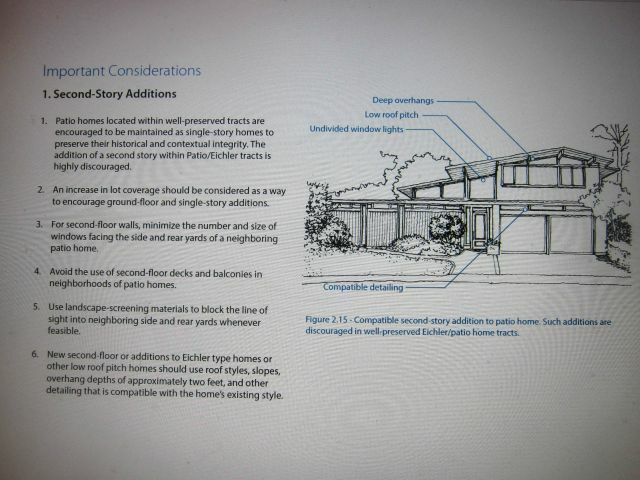 The city of Santa Clara's residential guidelines suggest best practices for allowing second-story additions in neighborhoods of "patio homes," meaning Mackay and Eichler homes. “We are inspired and influenced by mid-century, minimalist and modernist design, especially the work of avant-garde pioneers like Neutra, Quincy Jones, Saarinen and Niemeyer, as well as contemporary architects like Koolhaas, Piano and Ando,” they wrote. Quincy Jones was another architect who designed homes for Eichler. “The general tone of the public was that property owners should be free to do what they want, consistent with the codes and the city residential design guidelines,” Estes said of the architectural commission meeting. “One good thing that came out of this,” Parikh says, “The city will be looking more closely as two-story expansion. Before, I think, that was not the case and things were being approved that were pretty bad.